Mormon Mommy Writers and Friends: Just Got Back From My Trip to France! 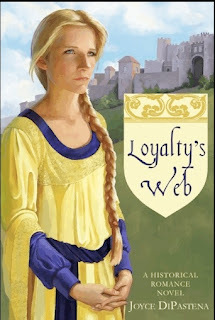 I just returned to 2012 Arizona after totally immersing myself in 12th century France via Joyce DiPastena's book, "Loyalty's Web" (Walnut Press, 2007). Now Joyce and I have know each other for a quite a few years, ever since we lived in the same small town and attended the same small ward over ten years ago with my husband's first job out of college. I remember translating (well, my husband and I) some family history from Italian into English, and in return we got a wonderful copy of their family's Italian cookie recipes. Which I still have and use. I've been eying her books for a while. I've always enjoyed history, but was more familiar with the regency/Victorian eras. So I followed Joyce slowly into the past. But it only took a page before I, too, was ensnared in "Loyalty's Web". Now that I've returned to the present, I need to give you a review of her book. The first thing I have to say is that even though it is a "romance", and there are descriptions of beautiful people, clothing, and homes, it was more like stepping into a time travel wormhole and being a fly on the wall. The setting was so realized, so clear and breathtaking in its scope that I felt SMARTER when I had finished. I was sure that I was now an expert in all things medieval. Alas, it was only Joyce's brilliant prose, seamless characterization, and fully realized world that made me think that way. In the end all I can say is READ IT!!! ENTER THIS CONTEST SO YOU CAN WIN YOUR OWN COPY! And to sweeten the purse, Joyce is holding her own giveaway for her new novel, "Dangerous Favor" (Walnut Springs, Jan. 2012). Hustle on over, follow her blog, and enter HER contest, too! Good luck, and don't forget to check out her new book coming out soon! Squeak! I can't wait! Yay! I am so excited! This book sounds really good! I am a follower of MMW on facebook, and I started following Joyce DiPastena. I also posted your blog on my facebook. I have been wanting to read this book!! So excited! I am a follower on MMW's Facebook page. I have posted MMW's blog on my Facebook. I have become a follower of Joyce DiPastena's Facebook page. Sounds like a really fun book! I could use a trip to France, even if it's only mentally!!! I want one. I'm on time does that count? Ha. 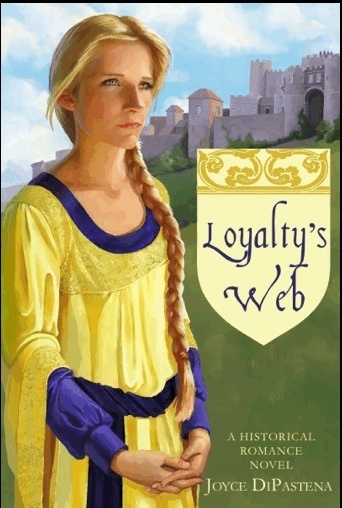 I'd love a copy of Loyalty's Web. I'm a follower and I went to Facebook and liked your page. Couldn't figure out how to follow it. I also follow joyce-dipastena.com. Congrats on the Anniversary of the Blog! I'd love a copy of Joyce's book!